PRICE SLASHED $200,000. 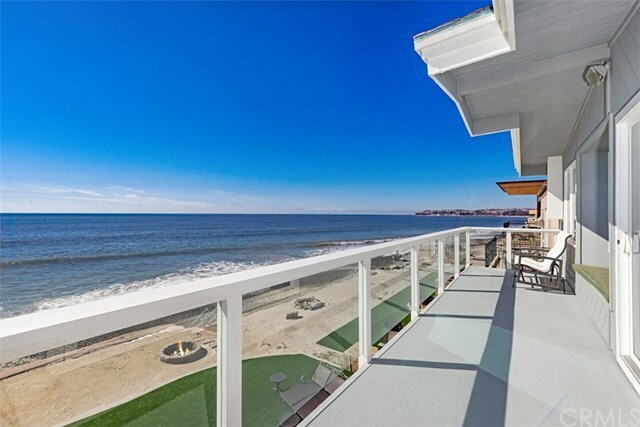 What an opportunity for you to own a spectacular Cape Cod/Contemporary oceanfront home right on the sand. Step through the front door into a home that shouts âStyleâ with its high coffered ceilings, floating staircase, and artistic copper/patina railings, and a fabulous elevated white water sit down view. This is casual living at its best, graced with wonderful amenities: Huge separate 2-bedroom apartment with full kitchen, 3 car attached garage, plus an additional 6 parking spaces. Gourmet chefâs kitchen overlooking the sea with 48â Dacor gas range, plus wall ovens and warming drawer, generous walk-in pantry with sink and beverage refrigerator. Private temperature-controlled wine cellar with capacity of over 750 bottles of wine plus copious extra storage. Beautiful Master Suite with access to oceanfront deck; his and her closets (Hers has an 11-foot island!). Full size elevator for ease and comfort. 12 kilowatt, paid for rooftop Solar System with 38 panels, Backyard features flagstone to turf to your personal sandy beach; patio with built-in barbecue and large spa. Pamper your pooch with his/her own 100-foot gated dog run with shower and doggie door! Enjoy exceptional beachfront living all year round in this exquisite property!